Braddon and Civic Centre from Mount Ainslie. Ainslie Hotel in front. 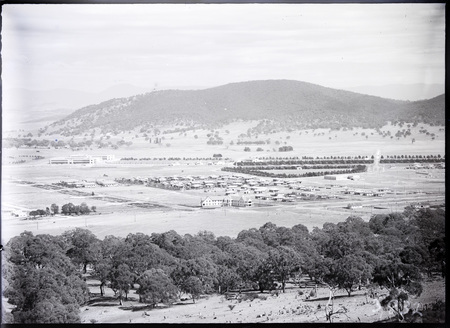 The rephotograph of Braddon and Civic Centre from Mount Ainslie, Hotel Ainslie in front is not a rephotograph. The area surrounded by trees in the mid right of the photo is Northbourne Oval on Donaldson St. The largish one-storey building rightish of Northbourne is Ainslie Infants School. Civic is the set of buildings on the left. The row of trees behind Northbourne Oval is the pine break between Braddon and North Ainslie if I'm not mistaken. I lived opposite Northbourne Oval from 1950 till around 1970 and I know the old area like the back of my hand. We rarely went anywhere as we had no car during the fifties. Climbing Mount Ainslie was one way of breaking our arms as children and I remember that there was a wide territory of fierce bull ants between Braddon and the Mount and it extended to the steps of the War Memorial, meaning that children who went on foot had to keep brushing the ants off and/or run to avoid being bitten. We also had a bull ant patch just under our front steps at no. 12 Donaldson St Braddon.